After an awesome church service tonight, I sat down on the side of my bed and could hear the sound of angel wings rustling all around. I can feel such a flurry of angelic activity right now with such a strong intensity. They are being released into those... moreAfter an awesome church service tonight, I sat down on the side of my bed and could hear the sound of angel wings rustling all around. I can feel such a flurry of angelic activity right now with such a strong intensity. They are being released into those dark places of your life to penetrate it with His Marvelous Light. The chariots of Fire are circling your situation! A Heavenly sound is going forth! The sound is much like the sound that David heard in the tops of the trees. The Host Of Heaven is on the move securing that victory for you! 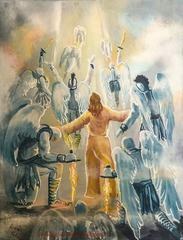 There are more Angels working for you than there are demons conspiring against you!